Follow UC Davis' ecogeomorphology students over the next two weeks as they apply their interdisciplinary classroom education to one of California's iconic watersheds: the Tuolumne. Students of hydrology, ecology, engineering, geomorphology, and economics work together to integrate their knowledge in this capstone course and test what they've learned at UC Davis in an expedition setting. See how they'll be inspired by the majestic views of Tuolumne Meadows by taking our virtual tour. 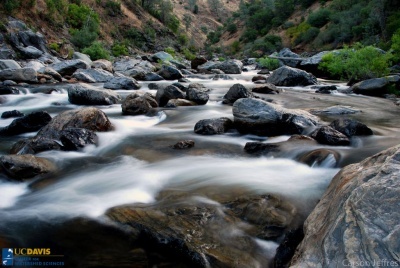 Glimpse a sample of the river and wildlife in our online photo gallery: Lessons from the Tuolumne. And feel the thrill of their three-day whitewater trek as you watch their training trip on the South Fork American River. At the end of their expedition, we'll post their papers to show how UC Davis' ecogeomorphology classes transform students into scientists. Please find links to our blog, Twitter timeline, and Facebook page below.